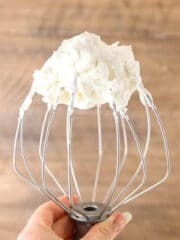 If you’ve ever wondered how to make whipped cream you’ll love this easy recipe with only three ingredients! 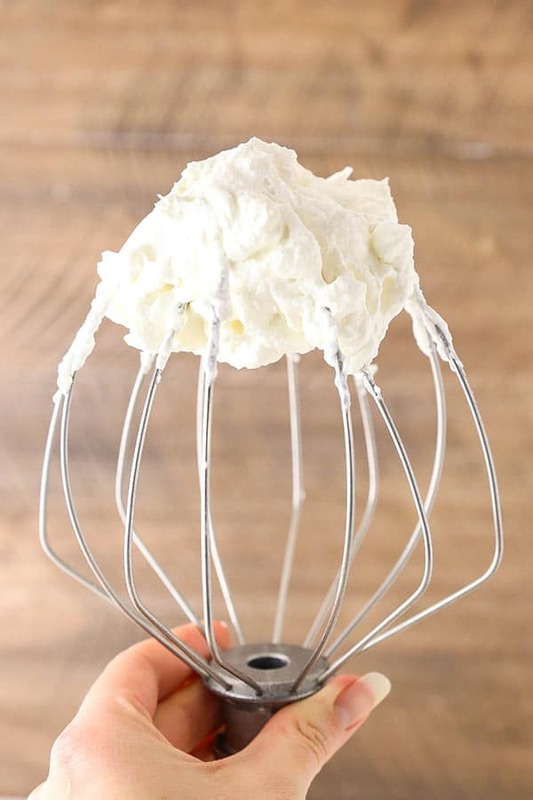 Don’t bother with the store-bought stuff – this stabilized homemade whipped cream is delicious and perfect for frosting cakes, cupcakes, cheesecakes, trifles and more! Growing up, we only knew of store-bought whipped cream. Making it homemade was just not a thing, so Cool Whip it was! When I made homemade whipped cream for the first time, I totally expected it to be difficult but it was SO easy! How had I not done this all along?! Once I realized my error, I never looked back! You need three very simple things to make whipped cream. Just heavy whipping cream (or heavy cream), powdered sugar and vanilla extract. That’s it! Start with cold cream. The colder the cream, the easier and more quickly it will whip. You could even freeze your bowl and whisk for 10-15 minutes before making it, but it isn’t really necessary. I like to whip the cream on high speed and get a nice, stiff whipped cream. I’m usually using it to frost cakes, cupcakes or any other dessert and I want to make sure it stays put, so I whip it until stiff peaks form. What that means is that when you lift the whisk out of the cream after whipping it, it stays in place. You could whip it a little less, but that’s my preference in most cases. Do be careful not to over-whip it though. You don’t want to walk away, because whipped cream happens quickly and if you leave it too long, you end up with butter. Cool, right?! But not what you want. Not only do I whip my cream until it’s stiff, I also use powdered sugar to ensure it doesn’t wilt. Because I use this whipped cream with desserts, it needs to stay in place for days at a time. I can easily pipe this whipped cream onto a cake or cheesecake and set it in the fridge and it’ll stay exactly as I left it. I’ve let things sit for a week or more and it stays as is. My general rule for the ratio of heavy whipping cream to powdered sugar is 2:1. So for every cup of cream, I use about half a cup of powdered sugar. You can certainly reduce the powdered sugar a bit (and I often do) and it’ll stay fine, but that math is easy to work with if you’re making larger batches. I wouldn’t reduce it by more than a couple tablespoons though. CAN YOU USE WHIPPED CREAM INSTEAD OF COOL WHIP? Because this whipped cream is so stable, it makes a great replacement for Cool Whip and other store-bought frozen toppings in recipes. And because I’ve been asked about that replacement so often, the recipe below makes the perfect amount for replacing 8 oz of Cool Whip. IS WHIPPING CREAM THE SAME AS HEAVY WHIPPING CREAM? They are very similar, but not the same. The difference is in the amount of milk fat. Heavy cream and heavy whipping cream contain 36% milk fat, while whipping cream (without “heavy” in the name) is lighter with 30% milk fat. Both will whip into whipped cream, but the “heavy” ones will hold their shape better and longer, making them the better option for this whipped cream. If you’ve ever wondered how to make whipped cream you’ll love this easy recipe with only three ingredients! 1. Add the heavy whipping cream, powdered sugar and vanilla extract to a large mixer bowl fitted with a whisk attachment. 2. Whip on high speed until stiff peaks form. 3. 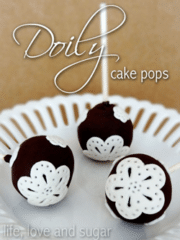 Use the whipped cream on any number of desserts including ice cream, cake, cupcakes, cheesecakes, trifles and more. 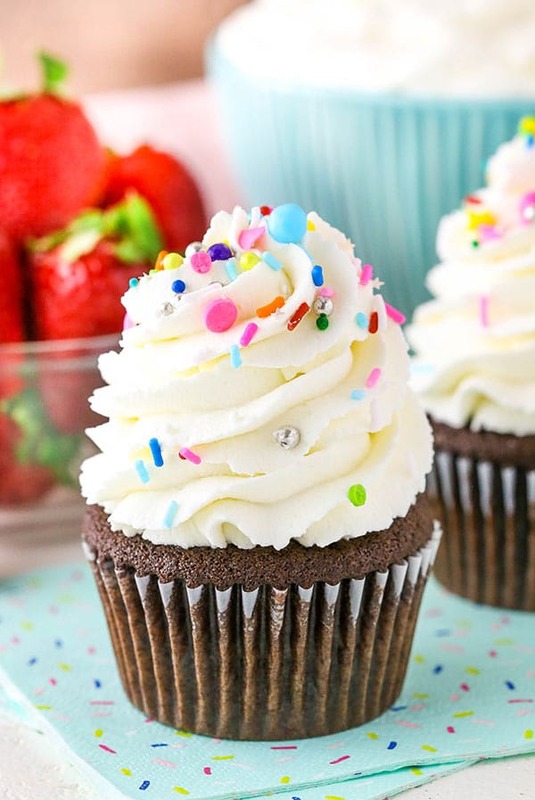 Whipped cream will stay stable when stored in the fridge for at least 5-7 days after piping onto a dessert. I suggest piping it onto your dessert shortly after making it. This looks and sounds so good!! I love homemade anything!! Homemade anything is the best, but especially whipped cream! It’s so easy – we should never buy that horrid canned stuff. I just followed you on Instagram too – I love looking at pics of food and dogs (that’s essentially all that’s on my Instagram feed). Can anybody recommend a good brand of coconut cream that can be whipped within desserts (i.e. not Asian! ), I am UK based and cannot seem to find anything here. Thank you Lindsay! 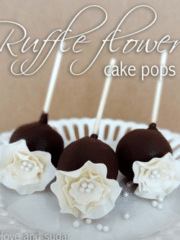 Hi Andrea – I haven’t experimented at all with coconut cream. I’m sorry. Lindsey and Andrea: I wouldn’t use Coconut Cream as it is mostly used for mixing drinks. I use the full fat Coconut Milk of Taste of Thai brand. Has lots of coconut fat content and I have used it in many baking recipes. Though I haven’t tried whipping it. Stay away from the low fat version, may not give good results. You can substitute regular granulated sugar for the powdered sugar, or not use sugar at all. The sugar can help thicken and sweeten it, but isn’t totally necessary. As for the cream, I don’t want to say for sure (it’d be worth trying) but I think you need whipping cream. I hope it works for you! Did you look at the homemade cool whip link? Where can I find the homemade cool whip link that you speak of ? It’s been several years since I mentioned that and I’m not sure what I was referring to. You can google homemade cool whip, but for the most part, they are all various ways of making a stabilized whipped cream. If you take your regular sugar and use a food processor or blender, you can make your own powdered sugar. Takes a bit of patience but works beautifully. So my question would be, how much heavy whipping cream is equivalent to 8 oz Cool Whip? Thanks in advance. 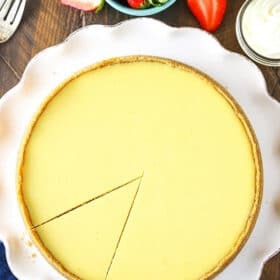 Looking forward to trying out the no-bake cheesecake soon! It’s about 1 1/4 cups of heavy whipping cream for 8 oz of Cool Whip. Hi again Lindsay! I finally had time to try out the no-bake Oreo cheesecake using “homemade” whipped cream, and I LOVED it!! Thank you for your recipe and this guide! 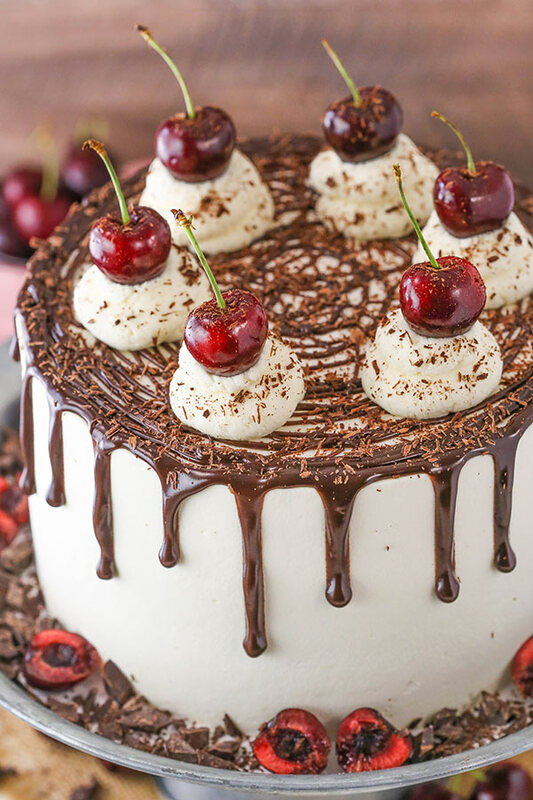 Hello, I came across your website when I searched for the no bake orea cheese cake and I wish to use the homemade whipped cream and I have a question! Do you recommand making the whipped cream on the day of making the cheese cake or can I make it the day before? If I make it the day before, should I freeze it for the next day or refrigerate it? Thank you so much! It should be just fine if you make it the day before and put it in the fridge. hi! why do i need to freeze the metal bowl nd whisk ? can i just omit this procedure? It’s best for the cream and utensils to be really cold so that the cream whips faster, but you don’t have to do that step. It’ll whip fine without it. How long can you store this in the fridge? Can you make a batch a freeze for a later use too? It should be fine in the fridge for day or so. In fact, if I want it to hold up a little better, I’ll add between 1/4 and 1/2 cup of powdered sugar. It thickens it and it’s less likely to “melt”. I have frozen versions with the additional powdered sugar before they’ve been fine. Hi just found your site thru google. You had said previously that you could freeze it? Can you or do you have that exact recipe? I don’t recall talking about freezing whipped cream. Did you just want to make it and freeze it for later use? This recipe looks great! I would like to make the whipped cream for a chocolate mousse pie that I currently use cool whip for. In my recipe I melt a bar of dark chocolate, add a beaten egg yolk and mix in a box and a half of fat free cool whip. I place the mixture in a pie crust and freeze it. Would I be able to do the same with your recipe for the whipping cream? Thank you so much! I would think it’d be fine. You’d want to use one and half of this whipped cream recipe. I found your page because I was trying to find a substitute for Cool Whip. I am trying very hard to avoid HIGH FRUCTOSE CORN SYRUP in the dishes I make and the things I eat. It is BAD for you and it is listed as the third ingredient in Cool Whip behind water and corn syrup. I wish Kraft would develop a healthy way of sweetening food products, but until they do, I will continue to avoid their products. I have not tried the heavy whipping cream but am in the process of making my dish as I type. I hope I remember to get back and post how it turned out. I hope you enjoy the homemade whipped cream. I have started using it for most things these days and love it. You can eliminate the sugar and extract by adding 1 to 1.5 tablespoon of Vanilla Instant Pudding. This gives the whipped cream a lot more stability as far a breaking up. Especially if used as a topping. 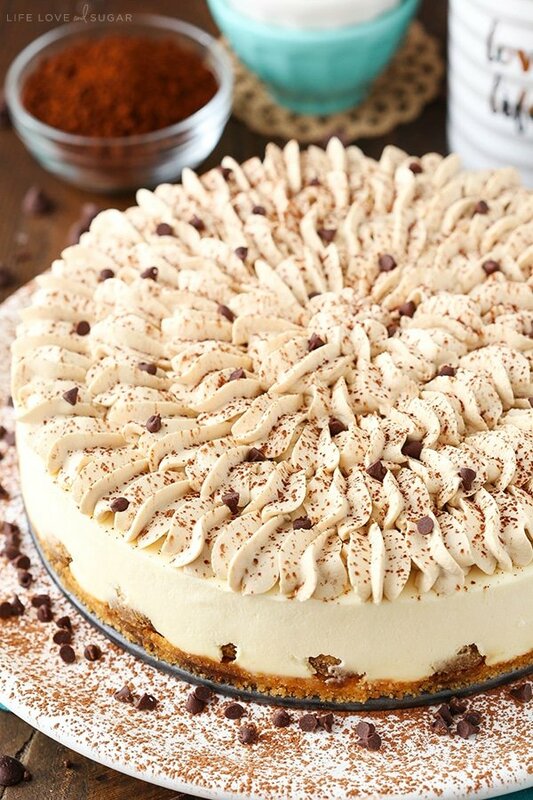 Hi Lindsay.. is one portion enough of this recipe enough for the no bake nutella cheesecake? Can this be made and put in the frig? To use on pumpkin pie or jello and such. Thanks so much!! Yes, it can be stored in the fridge. Just be sure to use enough powdered sugar to stabilize it. I’d say I usually use a 2:1 ratio, so if I use 1 cup heavy cream, then I’d use 1/2 cup powdered sugar. Will this hold up in a pistachio dessert where it’s in a layer with cream cheese? Not get runny? It should, just be sure to add the 2:1 ratio of powdered sugar so it stays firm. So for example, with 1 cup of heavy whipping cream use 1/2 cup of powdered sugar. Hi Lindsay! For your no churn ice creams (for ice cream cakes), does the whipped cream have to be stabilized with powder sugar? I usually use the Isi Whip to make my whipped cream since it’s so fast! I do use the powdered sugar as a stabilizer, yes. I’m not familiar with Isi Whip. Thank you for all of your postings. I have a question re: stabilized whipped cream. You recommend a 2:1 ratio of whipping cream to powdered sugar, yet the recipe indicates: 1 1/4 c. of whipping cream and 1/2 c. powdered sugar. Should there be less whipping cream or more sugar, or does it really matter? Thank you kindly. Help! Have been a subscriber of yours for years and LOVE your posts! But today, I cannot print the recipe. The screen is blank except for the blog credit line. What is wrong?? Thanks! I’m not sure what was happening, but it should be fixed now. Thanks! This recipe came at just the right time! 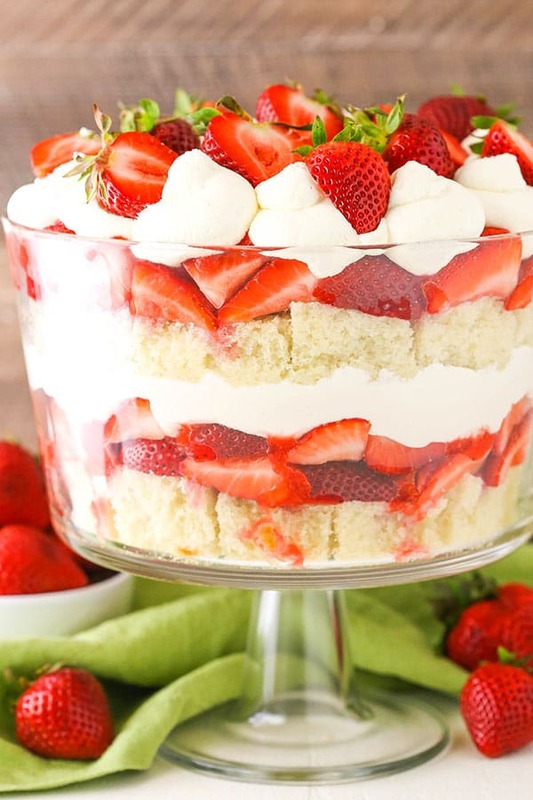 I am going to be making mini trifles for a part and wondered how I stabilize the whipped cream. Thank you for posting can’t wait to try it!!! Yes, this will be perfect! I use it all the time in trifles. 🙂 Enjoy! Can I add color to this recipe? 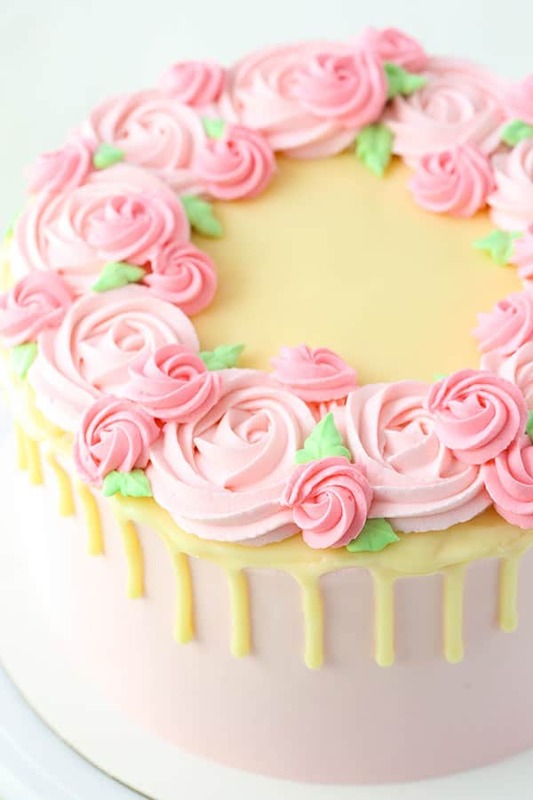 Yes, gel icing color can be added for color. Love your recipes. Thank you! Is powdered sugar the same as confectioners sugar? I made this for a church luncheon, and put it in a 9 x 13 pan for easier cutting. I made a little extra crust and left the filling amounts the same. 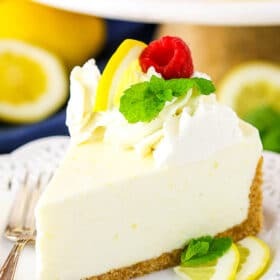 It was light, lemony, refreshing and delicious. Sometimes regular cheesecake is too heavy after a meal. With pretty whipped cream and lemon slice garnish it looked delightful on the tray as well. It was perfect! Thanks for sharing!